Obesity and weight gain have always been major concerns regarding the health and fitness of individuals; today, it has reached the level of an epidemic. Increasing obesity rate and increasing levels of awareness amongst calorie-conscious consumers in North America have opened new avenues for the weight management industry. The North American weight loss/obesity management market was worth $104 billion in 2012. The North America weight loss management market witnesses a growing preference for low-calorie diet food and beverages and slimmer waters/natural mineral salt drinks. With the introduction of technologically advanced and highly sophisticated fitness equipment, the use of cardiovascular and strength training equipment is on a rise. However, factors like availability of low-cost alternatives, adoption of deceptive marketing strategies, and high cost of customized services are hindering growth. Quick results of weight loss surgeries and insurance coverage have made bariatric surgeries popular among clinically obese people. However, the side-effects of weight loss surgeries have made people opt for non-invasive and non-medical methods of weight loss. As per the American Society for Metabolic & Bariatric Surgery, the total number of weight loss surgeries performed in the U.S. was 220,000 in 2012, likely to increase in the coming years due to the rising obesity rate. In Canadian hospitals, a total of 2,385 bariatric procedures were carried out in 2008–2009; it represented a 92% increase from 2004–2005. The North America region is covered in this study and further segmented by major countries - U.S. and Canada. The geographic split for all the sub-segments is presented at a regional and country level. The U.S. is the largest market for weight loss/obesity management market, followed by Canada. Atkins Nutritionals, Inc. (U.S.), Weight Watchers International, Inc. (U.S.), NutriSystem, Inc. (U.S.), Herbalife International, Inc. (U.S.), The Coca Cola Company (U.S.), and PepsiCo, Inc. (U.S.), Brunswick Corporation (U.S.), Precor, Inc. (U.S.), Ethicon Endo-surgery, Inc. (U.S.), Cynosure, Inc. (U.S.), Allergan, Inc. (U.S.), Equinox, Inc. (U.S.), Gold’s Gym International, Inc. (U.S.), eDiets.com (U.S.) are the leading players in the North American weight management market. This research report categorizes the North America weight loss management market and obesity management market into weight loss diets, fitness and surgical equipment, and services. These markets are broken down into segments and sub-segments, providing exhaustive value analysis for 2010, 2011 and 2012, as well as forecast up to 2017. Each of the market is comprehensively analyzed at a granular level by geography (U.S. and Canada) to provide in-depth information on the North American scenario. The North America weight loss Management market and obesity management market was worth $104 billion in the year 2012. The U.S. is the fastest-growing market due to the increasing obesity rate, rising awareness of health and fitness, aggressive marketing strategies to attract customers, and rise in number of diabetic patients. However, the economic slowdown, and high competition in North America will hinder the growth of the market. In 2012, the Organization for Economic Co-operation and Development (OECD) reported that the U.S. was the most obese country among developed countries; 36% of its population was obese. The U.S. accounted for the largest share of the North America weight management market in 2012. This is attributed to technological developments, new product launches, and the presence of more industry players compared to other developing regions. 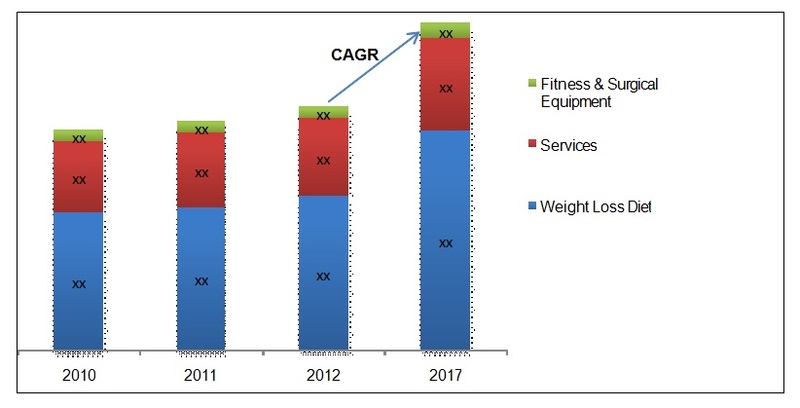 The weight management industry in North America is flooded with technological advancements and innovations, especially in the weight loss fitness and surgical equipment market. In August 2012, ProForm launched ProForm launched ProForm 505 CST Treadmill, installed with iFit technology that offers live online trainers and workouts powered by Google Maps. Technological developments have also taken place in weight loss surgical procedures. Minimally-invasive and non-invasive surgical procedures that use highly sophisticated equipment like endoscopes and laparoscopes have been developed. In addition, non-invasive weight loss techniques like cryolipolysis, transoral obesity revision surgery, cold laser shaping, and Stomaphyx are also gaining popularity. 9.9 Fitness First Group, Ltd.
9.10 Gold's Gym International, Inc.
9.12 Icon Health & Fitness, Inc.
9.13 Johnson Health Tech. Co., Ltd.
9.15 Life Time Fitness, Inc.
9.22 Weight Watchers International, Inc.